God's care over his people. (1-5) A promise of their recall to Divine favour. (6-13)1-5 The Lord Jesus with his strong sword, the virtue of his death, and the preaching of his gospel, does and will destroy him that had the power of death, that is, the devil, that old serpent. The world is a fruitless, worthless wilderness; but the church is a vineyard, a place that has great care taken of it, and from which precious fruits are gathered. God will keep it in the night of affliction and persecution, and in the day of peace and prosperity, the temptations of which are not less dangerous. God also takes care of the fruitfulness of this vineyard. We need the continual waterings of Divine grace; if these be at any time withdrawn, we wither, and come to nothing. Though God sometimes contends with his people, yet he graciously waits to be reconciled unto them. It is true, when he finds briers and thorns instead of vines, and they are set in array against him, he will tread them down and burn them. Here is a summary of the doctrine of the gospel, with which the church is to be watered every moment. Ever since sin first entered, there has been, on God's part, a righteous quarrel, but, on man's part, most unrighteous. Here is a gracious invitation given. Pardoning mercy is called the power of our Lord; let us take hold on that. Christ crucified is the power of God. Let us by lively faith take hold on his strength who is a strength to the needy, believing there is no other name by which we can be saved, as a man that is sinking catches hold of a bough, or cord, or plank, that is in his reach. This is the only way, and it is a sure way, to be saved. God is willing to be reconciled to us. 6-13 In the days of the gospel, the latter days, the gospel church shall be more firmly fixed than the Jewish church, and shall spread further. May our souls be continually watered and kept, that we may abound in the fruits of the Spirit, in all goodness, righteousness, and truth. The Jews yet are kept a separate and a numerous people; they have not been rooted out as those who slew them. The condition of that nation, through so many ages, forms a certain proof of the Divine origin of the Scriptures; and the Jews live amongst us, a continued warning against sin. But though winds are ever so rough, ever so high, God can say to them, Peace, be still. And though God will afflict his people, yet he will make their afflictions to work for the good of their souls. According to this promise, since the captivity in Babylon, no people have shown such hatred to idols and idolatry as the Jews. And to all God's people, the design of affliction is to part between them and sin. The affliction has done us good, when we keep at a distance from the occasions of sin, and use care that we may not be tempted to it. Jerusalem had been defended by grace and the Divine protection; but when God withdrew, she was left like a wilderness. This has awfully come to pass. And this is a figure of the deplorable state of the vineyard, the church, when it brought forth wild grapes. Sinners flatter themselves they shall not be dealt with severely, because God is merciful, and is their Maker. We see how weak those pleas will be. Verses #12,13|, seem to predict the restoration of the Jews after the Babylonish captivity, and their recovery from their present dispersion. This is further applicable to the preaching of the gospel, by which sinners are gathered into the grace of God; the gospel proclaims the acceptable year of the Lord. Those gathered by the sounding of the gospel trumpet, are brought in to worship God, and added to the church; and the last trumpet will gather the saints together. Look at verse 11 where the women (which is just a term to indicate those making bad choices) taking the withered and broken boughs or branches once destroyed and rekindling the flames of idolatrous practices. Small wonder the Father ends this verse with mercy being denied them. 27:10 is revealing but you have to look at verse 9 first. The stones of the altar beaten in sunder with the groves and images undone. This is symbolic of idolatrous practices hated by the Father which are destroyed by him. Now go to verse 10 where the calf or the offering on these idolatrous altars or within these groves is eating the branches or arms of these idolatrous practices. Very funny. "When the boughs thereof are withered, they shall be broken off: the women come, and set them on fire: for it is a people of no understanding: therefore he that made them will not have mercy on them, and he that formed them will shew them no favour." There is a generation which the LORD has rejected, and will not have mercy when He comes: what began with a city and a tower, and crucified the Lord. Lord bless those who believe! 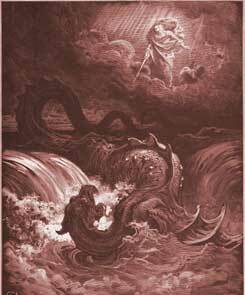 I think the leviathan represents a submarine that weaves its way through the oceans. It is long like a serpent. Its power is immense and it is in the sea, not on it, as stated in verse 1, and travels unseen. There are writings that say the leviathan is 300 miles long but that fits a submarine also because the missiles it fires travel easily that distance and more. I think this chapter goes back to Esau and Jacob and explains why there is so much conflict over the land that should rightfully be Israel. There will be conflict until the Temple of Jerusalem is built and even Israel 's enemies will ultimately bough to worship God as supreme. This Chapter like war in the mist. there also a answer at the end of the Chapter. The Lord know who for him or against him. It talks about the end after this world. What Do You Think of Isaiah 27? According to Isaiah, which mythical creatures will the Lord punish?